If you own a local business, getting it listed in the coveted “Google 3 Pack” search results can add $1,000’s to your bottom line. That’s because the companies displayed in the 3-Pack get many more phone calls and visits than companies that don’t show up in the 3-Pack .. and more calls and more visits lead to more customer engagement, more sales and more revenue. (2) what they can do to get their business listed in the Google 3-pack. Before beginning, it’s important to understand that Google’s algorithm (the rules and guidelines that determine which business listings they display at any given time to any given individual) is in constant flux. So there is no guarantee that the steps outlined below will get you into the 3-Pack, especially if the 3-Pack is already filled with competing companies in the same town that have been proactive, thorough and consistent in keeping their Google business profiles accurate and up to date. On the other hand, if you follow the steps outlined below you will improve your chances of getting your business listed in the Google 3-Pack .. especially where your competitors are not actively managing their Google business listings and actively encouraging their best customers to review them online. Step 1: Claim and Verify Google Business Page. If you have not already created a Google Business Page for your business, the first step is to visit the link below and select your business type, and then follow Google’s instructions to set up your Google Business Page. For local businesses, you should select either Storefront (if customers come to you) or Service Area if you provide services at the customer’s home or business location. Your Google business profile has two components: Your Google+ page (which is what most people will see) and your Google Maps Listing. New Google business pages set up through the Google My Business platform are automatically linked to their Google Maps listing. However, older G+ Pages or G+ Local Profiles may not be linked to their Google maps listing. To see if your Google Business Page & Map Listing are linked, login to your Google My Business Dashboard, click on the page you want to manage, and click on the Gear Icon at the top right side of your Google Business Page. (See illustration below). A new page will open where you can customize the settings for your Google Business Page. If your Google Business page is not connected to your Google Maps Listing, you will need to go to go to Google Maps and type in your business address in the search bar. Your business name should show up at the address you have typed in. 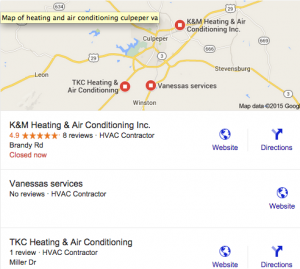 Once your Google Map is linked to your Google Business Page you can start optimizing them. Go to Google Map Maker, position your map pin at your front door, edit your map categories, edit your business NAP (Name, Address Phone) data, and remove or edit inaccurate information. 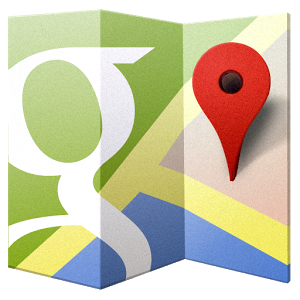 When you are satisfied with the accuracy and completeness of your Google Maps listing, return to your Google+ listing. Make sure that your Google Map categories are identical to your Google Business Profile categories, and be sure to populate the “About” section of your Google Business page with good, keyword rich content. Make sure your website URL is linked in your Google Business Page, and that your business hours and other optional information is populated. Google may impose a 2-month waiting period for new Google Business listings before they begin to rank in the Google 7 Pack. If you have recently made substantial edits or changes to your website, Google+ Page, or Map Listing, you might find yourself stuck in the 2-month incubation period. If you’ve followed the steps above, and you can’t get into the Map rankings, you may be in an incubation period, or you may be competing with other businesses that are jockeying for position on the Google 3-Pack. Google’s July 24, 2014 “Pigeon Update” placed increased importance on local directory listings as a factor in local search results. The best place to begin your local directory submissions process is with the top four “data aggregator” companies (Acxiom, Factual, Infogroup and Neustar Localeze). These companies disseminate business listing data to more than 300 other business directories all around the web. Because accurate local business directory listings are an essential component of your Local SEO efforts, this task should be delegated to an experienced professional Local SEO expert. This is not the place to save money by doing it yourself. It is a time consuming process and it’s essential that your business name, address, and phone number be consistent and accurately submitted to each directory. You should also create and manually submit your business directory information to popular business directories like Yelp, Yellowpages, Yahoo! Local, Manta, and Superpages. Make sure that your Business Name, Address, and Phone Number (NAP) is consistently listed in every directory. The more Google sees your accurate NAP information, the more credible you are as an established business in Google’s eyes. Google has confirmed that the frequency, engagement, and quality of Google+ posts is a ranking factor for Map Listings, and can help you get in — and stay in — the 3-Pack. You can improve your chances of getting into — and staying in — the Google 3-Pack listings by regularly posting new content and photos to your Google+ page. Any content you post on your Facebook page can be shared on your Google+ page as well. Step 5: Seek and Monitor Citations in Other Websites. When other websites mention your business name in its entirety, this is known as a “citation. Google assigns “points” for each citation it finds for your business. The more points you acquire, the more prominent you become in Google search results. As you can see, there are many steps to getting your business listed properly in Google and other business directories to expand your company’s digital footprint and maximize the likelihood that your customers will find you online, call you, visit you and buy from you.